Typical details of construction elements. In this section we briefly describe the materials that are used in a standard Ecotek construction. 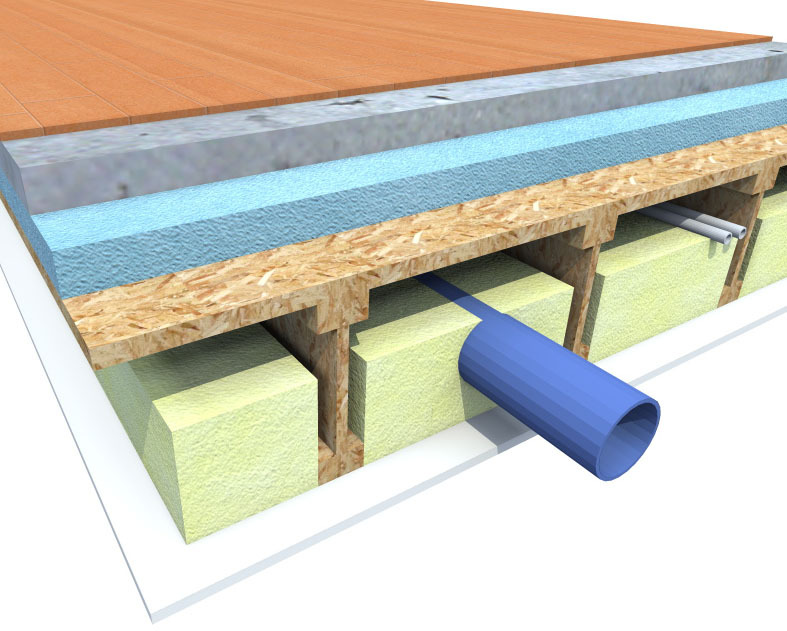 The Kingspan TEK Building System consists of structural insulated roof and wall panels, which can be used to create buildings with a maximum of 4 storeys including a room-in-roof construction. Because of their light weight of 25kg/m² they are ideal for use, where heavy constructions are not possible. With an additional steel main support frame, higher buildings can be constructed. Thickness: 142 mm (2 x 16 mm OSB 3 +110 mm rigid urethane insulation) Width: 200 mm (min) – 1245 mm (max) Length: 7450 mm (max) – for walls a maximum 3m storey height is allowed. Pitched roof construction with SIPs panel. We usually use clay roof tiles and prefer to use the imported quality. The reason for this is that the imported tiles have better uniformity in their size and thus fit better. The panels are covered with a premium breather membrane and then directly battened to accept the roof tiling. A special fillet is produced at the eaves end of the roof to direct any moisture above the fascia board and protect the finish. We recommend that guttering is used around your roof to reduce maintenance on your outside wall finishes and to stop the fascia boards from peeling. 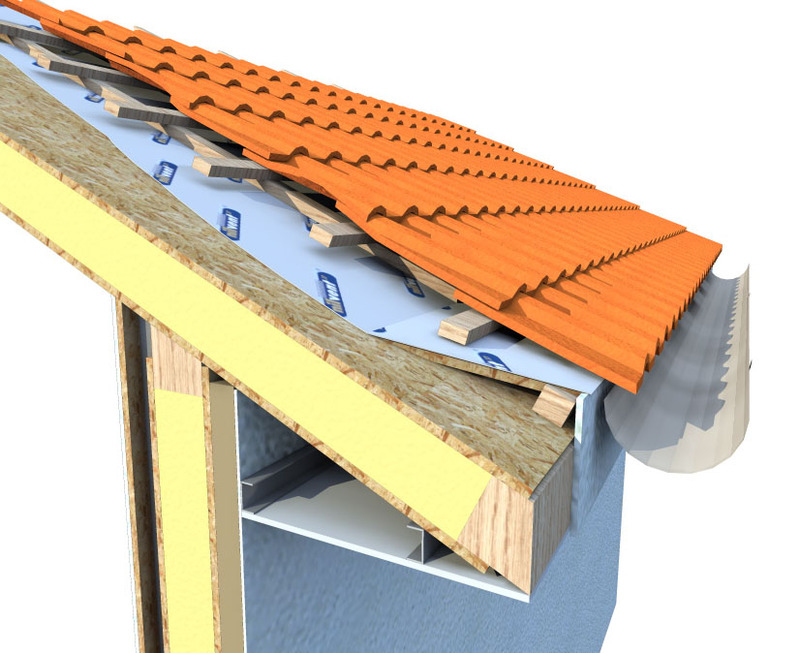 The soffit board can either be horizontal or angled underneath the roof panel. Flat roof construction with truss joists. 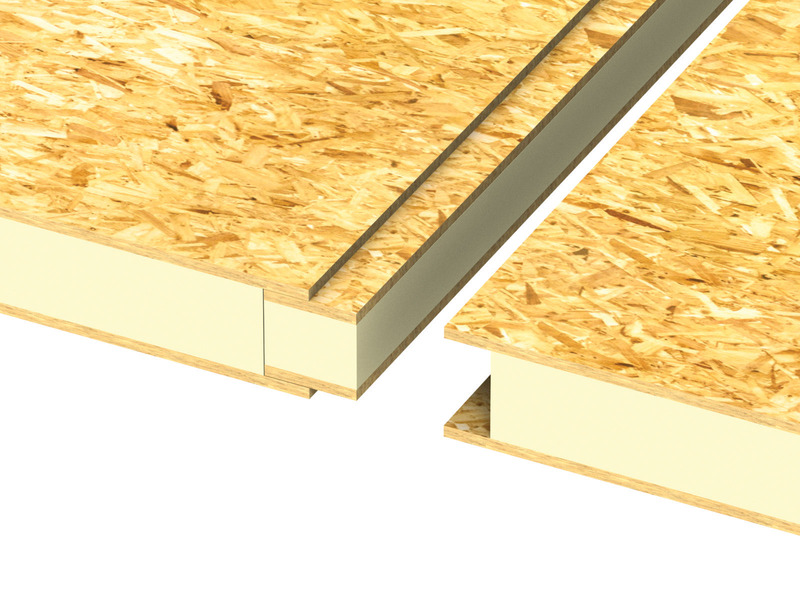 Flat roofs with excellent thermal insulation are achieved with minimum 24 cm I-joists, and T&G decking and can be designed and specified to support any load. A high performance elastomeric membrane inverted roof system completely tanks the roof and the surrounding parapets to provide very high levels of waterproofing safety. With over 20cm of thermal insulation as well as 10cm of solar reflective white stone chippings, the flat roof exceeds European thermal insulation standards. The total flat roof thickness is 42 cm deep. Intermediate floor construction with truss joists. 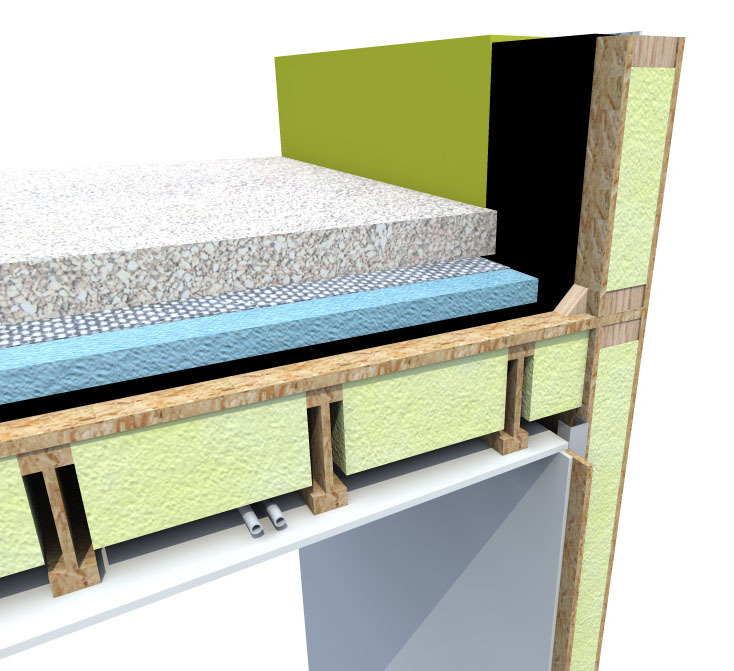 For transmission sound insulation we add 10cm of Rockwool between the joists and for impact sound to deaden the sound of footsteps overhead we add 5cm of XPS on top of the decking. We then cast a 5cm concrete screed on top of XPS to give the floor very solid and strong characteristics which is preferred by all of our clients. Services up to 10cm in diameter can be routed through the floor void in both directions, and we design the floors so that there are no downstand beams in the ceiling. The total floor thickness is 37cm deep. 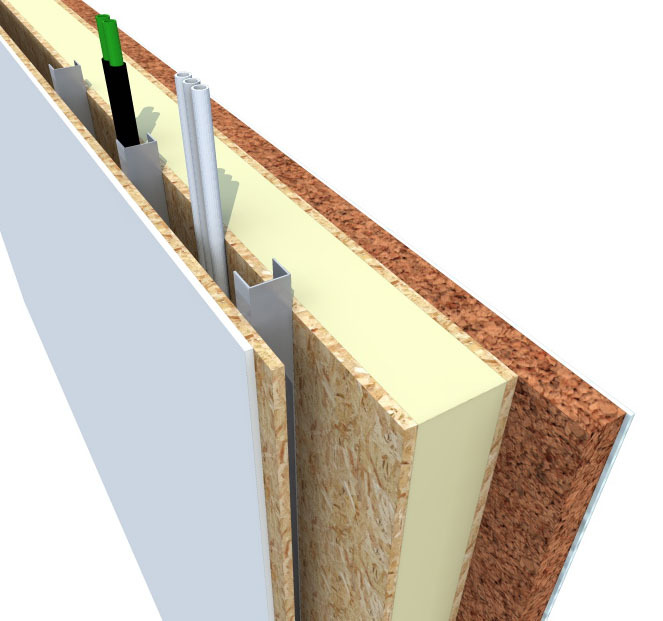 The wall panel is 14cm thick, is structural and provides the highest levels of thermal, sound and fire insulation of any construction method. A 5cm deep service void is provided internally for the electrical and plumbing installation, for maximum services flexibility and is covered with OSB sheeting before being finished in plasterboard. The advantage of this system is that even large loads can be simply fixed to your walls with wood screws. The walls also stronger and do not rattle or shake. Externally, a high performance external render system with either 5 cm Rockwool Batt or EPS is fixed directly to the panel, increasing all of the insulation properties while protecting the structure. The total wall thickness is 23cm which means you will not lose any internal extra space with our system. To achieve this level of insulation in a traditional wall you would need it to be nearly twice as thick.